Just like the daikon in early winter, we thin the carrot seedlings down to one little orange guy per hole. It's a mildly heart-breaking affair as it always seems a shame to waste so much lovely vegetable matter, although there is something to be said for adding to the compost pile. I decided as I pulled little lovely after little lovely out of the ground yesterday that I ought to do something with at least some of them. The greens, small, tender and aromatic, will whip up into an excellent dish on their own, but what to do with those little orange roots? As the sun beat down on my shoulders a desire for a cold beverage took hold, and then it came to me: cold carrot ginger soup. A recipe began to take shape there in the field, and after a quick conference call with my sister-in-law, gardener and cook extraordinaire, I sorted out a few details and set out on a journey of experimentation. 2 inch piece of ginger, washed and grated. 1/2 cup dashi, because no soup is complete without it. Or a broth of your choice. 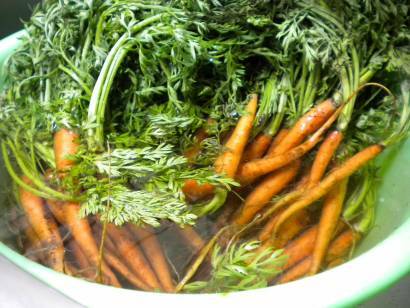 Slice the carrots thinly and steam until tender. Drain and save the liquid. Mash the carrots. (I don't have a blender, but that would work well, too. I just used an antique potato masher like my mother's.) Add in the liquid left over from the steaming process and keep mashing until you get the consistency you want. Toss in the dashi and grated ginger, and simmer for about 15 minutes to let the flavors meld. Chill in the refrigerator. Eat. For a more attractive soup, be sure to really tidy up your carrots and cut away the green bit just below where the leaves meet the root. I say this as the woman whose husband said her eggplant pickles reminded him of octopus. Consider yourself warned. I was at a loss for spices, and my sister-in-law didn't get one of my emails in time for the publishing of this post. I fully expect she'll have an opinion or two about it, and I'll add that information here. I threw in a pinch of cumin seeds, but I left them out of the recipe here as it's too soon to determine the results. I think garlic might have been good, too. Thoughts? *Seriously, make this salad. You'll never regret it. I think soy milk instead of water could work very well too. Of course you need some water to cook (or steam) vegetables first, but soy milk (plus little bit of milk is also nice) makes soup to have deeper taste. wow this cold soup recipe sounds easy! Anjuli, It is so terribly easy. I was rather shocked when I made it. Carrots steamed while I did dishes, and then it was simply mashing, grating, stewing and cooling. Eri, That's brilliant! I'll try it with the next batch. I'll let you know!